If you thought that Republicans in Congress were done trying to take away your health care, think again. With just two weeks left before their deadline to ram through health care repeal using the purely partisan budget reconciliation process, the Senate is reviving its effort to strip coverage from millions of people. They are driving forward with a bill from Sens. Lindsay Graham (R-SC), Bill Cassidy (R-LA), Dean Heller (R-NV), and Ron Johnson (R-WI) known as Graham-Cassidy. Like previous repeal legislation, it would end protections for people with pre-existing conditions and cap funding for the Medicaid program in a way that jeopardizes coverage for seniors, women, people with disabilities, and low-income children. Furthermore, it would change funding for Medicaid expansion as well as the tax credits that help people afford coverage to a block grant and end this funding entirely after 2026. 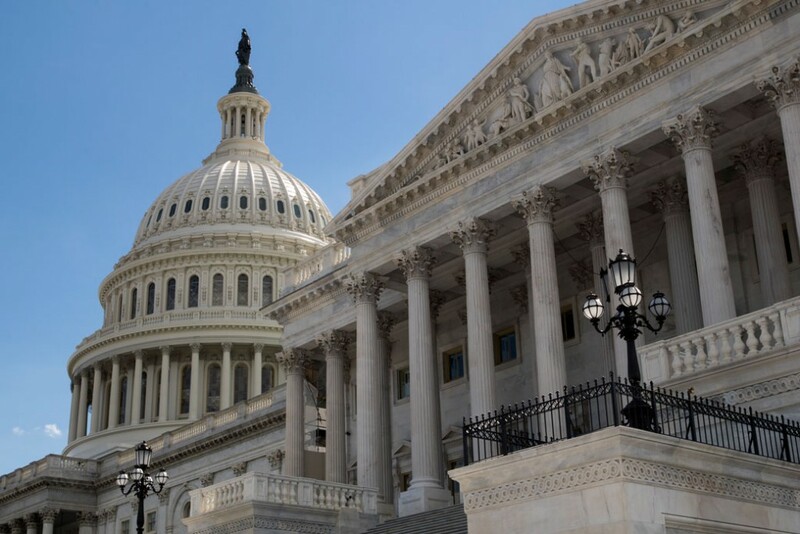 This time, however, their repeal efforts jeopardize another key health care program: Federal funding for the bipartisan Children’s Health Insurance Program (CHIP) expires on September 30. CHIP covers nearly 9 million children, many of whom wouldn’t otherwise be able to find the same comprehensive, affordable, quality health care. CHIP also provides health care for pregnant women, serving thousands of women annually. Although coverage varies by state, CHIP generally provides important services that keep women and their children healthy. Federal funding for CHIP expires on September 30, the same deadline for repealing the Affordable Care Act (ACA). If Congress doesn’t act soon, this funding will run out at different times in each state, leaving kids without the care they need. Just days ago, key Senate leaders reached a bipartisan agreement on extending CHIP funding for five years. But the Senate’s new pivot back to a partisan ACA repeal bill jeopardizes the prospects of passing a CHIP extension in time. As the clock is ticking on CHIP, Congress is using precious time trying to take health care away from even more families, including through dismantling Medicaid, which covers more than 30 million children. Given that, together, Medicaid and CHIP have been central in historic gains in children’s health care coverage, this is a one-two punch of taking away health coverage for kids. 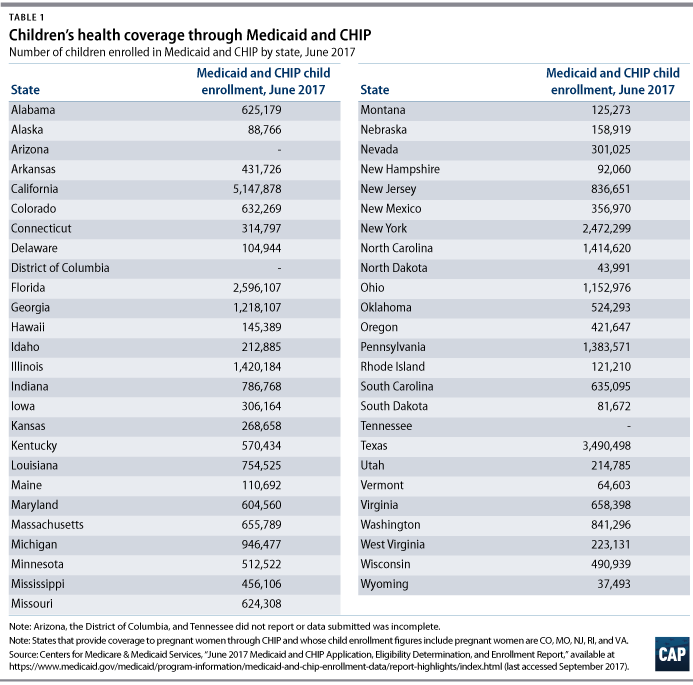 Here’s how many children have Medicaid and CHIP coverage in each state. Children in these states—Arizona, Oregon, Idaho, Nevada, California, Hawaii, Utah, Mississippi, Pennsylvania, and Connecticut—are most immediately at risk, as CHIP funds for their insurance will run out first. Arizona’s children could be especially at risk given its recent experience of freezing CHIP enrollment due to budget difficulties from 2010 until 2016. With current uncertainty around federal funding, the state has stated there may be another enrollment freeze, and it is getting ready to let families know. Cutting Medicaid and playing politics with CHIP is cruel and counterproductive. Medicaid and CHIP coverage is critical for the health and well-being of children. Given the high cost of care, it’s essential that programs such as CHIP continue to provide coverage for as many children and women as possible and that Medicaid not be cut or dismantled. Moreover, Medicaid covers key early detection and prevention services for kids as well as important services for children with disabilities that would otherwise be out of reach for many families. Families and states must be able to plan for their health care needs and expenses. The considerable uncertainty created around health care programs this year has left many families worried about coverage and their family’s economic stability while creating a cloud of uncertainty around state budgets. Rather than cutting children’s health care coverage and jeopardizing coverage for millions more, Congress should abandon ACA repeal, pass a clean reauthorization of CHIP, and continue bipartisan efforts to stabilize insurance markets to ensure Americans can stay covered. Melissa Boteach is the vice president of the Poverty to Prosperity Program at the Center. Theresa Chalhoub is a senior policy analyst for the Women’s Health and Rights Program and Health Policy at the Center.